Back in the day, all the railway stations had railway cats. Garath and Andy both work at Huddersfield train station in Yorkshire. To pass the time and scare away boredom while on shift the pair passes around ideas on ways to make the station better. When one day one of their ideas take on a whole life of its own and before anyone knows it, things are being put in place to make it happen. What is this idea? A railway cat. 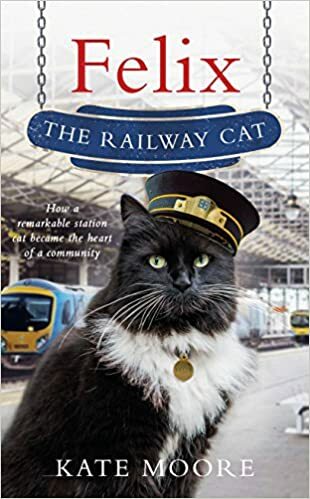 When Felix arrives at the station at only eight weeks old, nobody is prepared for life-changing effects one little cat can have on an entire station. I got this book from Netgalley in exchange for an honest review. Now I am a huge cat lover, I have had cats my whole life and I love books about Cats, my favourite being the series following Alfie the Doorstep Cat as this reminds me so much of my little furry friend, so seeing this book and hearing all about it made me very excited, however, I must say I got halfway through the book and nothing seemed to be happening, the cat had gone to the station yet the story didn't seem to be progressing after that. I must admit I did give up on this book. I just couldn't imagine it getting any better. I have chosen to give this book a single star out of five as I couldn't finish it. I wouldn't recommend it nor would I attempt to finish it. I feel a bit let down as I had heard so many good reviews on this book but I myself could not get into it.